Time: Approximately 8 – 10 minutes depending on storyteller delivery and children’s responses. Good morning and welcome. Today our story is about Saint Francis of Assisi. Saint Francis is one of the most beloved saints of all time. He celebrated life and swept everyone up in his simple, childlike nature. There are many stories about him talking and preaching to the animals. Today you will hear two of these well-known stories. Father Francis and his companions were making a trip through the Spoleto Valley in Italy. Suddenly, Francis spotted a great number of doves and birds of all varieties. Francis left his friends in the road and ran after the birds. He greeted them, “Beloved birds.” He expected them to scurry off into the air as he spoke, but they did not move. Francis reminded them again, “Always give praise to God.” Having finished his sermon, Francis made the sign of the cross, and gave them leave to fly away. Then all those birds rose up into the air, singing most sweetly and then they divided themselves into four companies forming the sign of the cross. One company flew towards the east, another towards the west, one towards the south, and one towards the north; each company as it went singing most wonderfully. Signifying thereby, that as St Francis, the bearer of the Cross of Christ, had preached to them, his message would be carried by them, that like Father Francis and his humble friars, the birds should possess nothing in this world, but should rely on the goodness of God. Francis, rejoicing and giving thanks to God, went on his way. 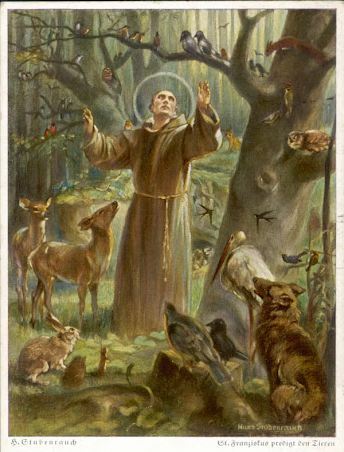 Later, he wondered aloud to his companions, “I wonder why I have never preached to birds before.” And from that day on, Francis made it his habit to invite all birds and animals to praise and love their Creator. Many times during Francis’ life, remarkable events of Francis speaking to the animals occurred. There was even a time when he quieted a flock of noisy birds that were interrupting a religious ceremony! The story begins as Francis arrives at a town, Alviano, to preach the word of God. He ascended to the top of a balcony to where he could be seen by all. Francis spoke in a clear voice “May I please have silence?” The people became quiet and waited reverently. However, a flock of swallows that were building nests there continued to chatter away, making it impossible for the people to hear. Francis spoke to them, “My sisters, the swallows, it's my turn to speak now, because you've already said enough. Listen to the word of God. Stay still and be quiet until it’s over.” To the people's amazement, the little birds immediately stopped chattering and did not move until Francis had finished preaching. At the end of it, the swallows joined in the song of jubilation sung by the people giving praise to God. Those who witnessed this sign were filled with wonder and said, “Truly this man is holy and a friend of the Most High.” Then the bells in the church began to ring all by themselves and the people crowded around Saint Francis, ready to follow him. Saint Francis could speak to the birds and elemental life because he was filled with the Holy Spirit. When he was not preaching, Francis would go deep within the secret chamber of his heart and commune with his Christ Self and meditate on his threefold flame. Today, as the ascended master Kuthumi, he encourages us to do that too. We can call to Kuthumi to teach us how to be close to our Christ self. 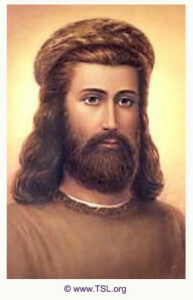 Saint Francis is a reincarnation of the ascended master Kuthumi. You can see Kuthumi’s picture up here on our altar. (Point to picture.) Kuthumi serves with Jesus as a world teacher. Before that he was the chohan of the second ray of God’s wisdom. Thank you for being here. Have a wonderful day. Permission is granted to copy and share this lesson in its entirety, including all copyright and contact information. This lesson may not be sold or used in any way to gain profit. Published by Montessori International. Copyright © 2014 Summit Publications, Inc. All rights reserved.